Discussion in 'Air Force' started by adeptitus, May 26, 2006. Mao", and I think I've got the characters right, but I'd like to make sure. Your friend did a good job replicating the characters from the photograph. The only sort of problem I see is that the 岁 character's bottom stroke is a little off. However, this is not a problem since the same stroke is present in the original photo. SteelBird, DGBJCLAU and Deino like this. It might be an issue of Simplified vs Traditional Chinese. This is what the traditional character for 岁 looks like: 歲. 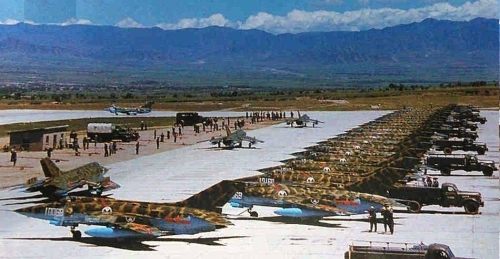 Besides, simplified Chinese was common in the Mainland during the 1960s, around the time the Mig-21 was introduced to China. Somehow link is 404ed. But I found this is the Brigadization of the PLA Air Force report I've previously downloaded (and it's still downloadable now, so I guess the url was changed). This open-source work strikes me as both venerable and unsatisfactory. Apart from the sketchy numbers (for example the ridiculous J-10B number, the missing Su-27UBK number which should be easy to compile, among other things), it even has a few dozen grammatical and spelling mistakes... The J-7 numbers are probably far from accurate either, even if we apply a Feb. 2018 cap for available information. The author is also on SNS (ex. Quora) and he seems to know his stuff, so I'm kind of surprised but in the meantime not very - because he's a strategic instead of tactical/air force guy. He did say somewhere that he was merely in charge of overseeing the work which came from a team though. I wonder if anyone else here on SDF has anything to say about this work. Or maybe this question should be raised in some other thread? would it be prohibitively expensive to convert these to drones? What happens to older aircraft that are being replaced in a modernization process ? SinoDefenceForum.com community offers the place to discuss strategic Chinese defense, military, military hardware, defence technology and geopolitical issues! We pride ourselves on offering unbiased, mature, and critical discussion among people of all different backgrounds.